In this week's episode, Stacy and Sarah.............................................. Listen to find out! We hope Stacy is having a great time and that the boys are learning a lot, enjoying the culture and the great food!! Sessions talk abut nutritional science, easy and sustainable weight loss, data and study reviews and what it all means! I need more offal recipes! I am eating paleo AIP and my extended family is slaughtering some pigs. I want to use the whole pig, but I don't know how to fix the feet, ears or eyes. And I don't have recipes that I like for the melt, head meat or tail. I find plenty of recipes for liver and eat it regularly. I have also made fried pig rinds, cracklins and of course lard. I love Stacy book Beyond Bacon but want to find more recipes that I can eat as AIP with few reintroductions. I currently have pig feet and ears in my freezer from last season, and we are about to butcher again. No one else wants to fix these parts, but I would end up extra and free offal if I only knew how to prepare it. And I might also convince extended family members to eat it too. I love your show and have been listening weekly for a few years now. Stacy loves to use pig feet for pork broth! Make a simple Shepard’s pie and mix in the organ meats! Pig Feet/Ear broth!! SOOO YUMMY! Ground hamburger pattys add organ meat chopped up! Smoking the jowl is DELICIOUS!!! Same texture as eggs so you don’t even know it’s there! Can be used in broth/pot roast and it is delicious! Boil or slow roast and treat like carnitas/tacos and kids LOVE IT! Alpaca liver is the best Sarah has ever had and would eat it straight out the frying pan!! New record for longest episode!! Doing it for your health, respecting the animals, and the earth! Episode 346: Can you have a healthy gut if you don’t eat paleo? 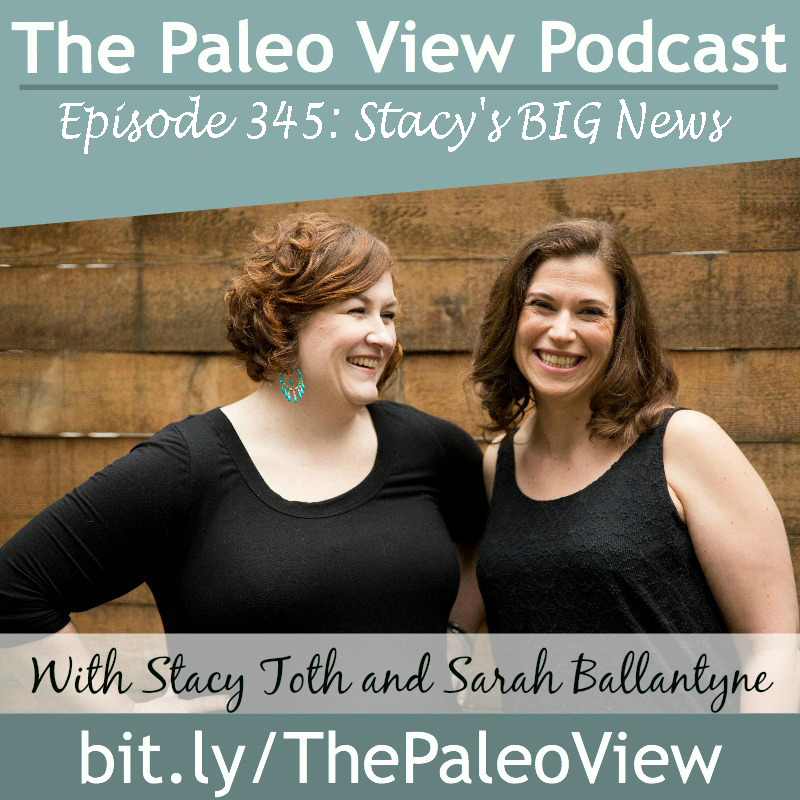 The Paleo View (TPV), Episode 346: April 5th Sponsored by Just Thrive - Can you have a healthy gut if you don't eat paleo? I've been eating flour, dairy, and sugar my whole life. I now take a probiotic and eat fermented foods when I can but my gut is still not good. I can feel it, smell it and see it in my bowels. They are mushy and not formed (sorry for the tmi!) what can I do to heal my gut? I'm not sure simply adopting the paleo approach will heal me...? March 4, 2018 Stacy marched forth in support of Beauty Counter's annual anniversary on Capital Hill in DC to support better personal care products Health Protective Safety Laws for everybody! FDA statement:The law governing the FDA’s oversight of cosmetic products — have not been updated since it was first enacted in 1938. The current law does not require cosmetics to be reviewed and approved by the FDA prior to being sold to American consumers. There are reasons why the FD&C Act doesn’t require prior approval of cosmetics before marketing… This means that ultimately a cosmetic manufacturer can decide if they’d like to test their product for safety and register it with the FDA. To be clear, there are currently no legal requirements for any cosmetic manufacturer marketing products to American consumers to test their products for safety.Tests confirmed the presence of asbestos in three of the product samples collected from Claire’s and one sample collected from Justice. All suspect Justice products, including the one testing positive for asbestos, were previously recalled from the market in 2017. The FDA issued a Safety Alert today warning consumers to not use three of Claire’s products: Claire’s Eye Shadows – Batch No/Lot No: 08/17; Claire’s Compact Powder – Batch No/Lot No: 07/15; and, Claire’s Contour Palette – Batch No/Lot No: 04/17 because they tested positive for asbestos.The FDA requested that Claire’s recall the products because they should not be used by consumers. Claire’s has refused to comply with the FDA’s request, and the agency does not have authority to mandate a recall. The FDA is therefore warning consumers not to use these products and will continue to communicate our safety concerns about them. Read the full statement from the FDA here. Claire's didn't recall all of their products. Will be able to enforce recalls if they act does what it's supposed to do! Relationship between corporations and consumers would be adequate to have products be high quality and not potentially carcinogenic. After a lifting injury Stacy trained 3hrs a day, 3 times a week and found a new passion. Sarah and the team wish Stacy the best and by the end of this summer Stacy will know if this choice will work for her and her family! We love your questions and we want to hear from you! There's no end to questions we can answer and topics we can address! Engage on social media! That's how we get feedback! In this week's episode, Stacy and Sarah answer a listener question about how to treat acne naturally, especially in kids going through puberty. What should they be eating? What skincare products are the best? And what nutrients are best for acne? Listen to find out! Joovv's red light therapy units are Bluetooth enabled, they work with Alexa, and they're modular! Hi Sarah, I wonder if you might have some advice on diet and possible supplements for girls going through puberty? My 11yr old is suddenly experiencing lots of pimples on her face. We stick to a mainly paleo/Keto based diet. No wheat or grains and minimal sugar. I am trying to get her to cleanse her face twice a day - this is a slow process.If you have any health info or products specific to puberty please let me know. Stacy says the best thing you can do for acne is to treat it from the inside. Acne isn't just a puberty problem - it can be a problem all through life. Parents, this can be a lot to take on for a kid so don't let perfect be the enemy of the good. Yes, diet and gut health are important, but for most kids it won't be everything. It will likely improve it, but won't make it go away entirely. For Stacy's son Cole, using a toner has been very beneficial. A toner is what you use after washing your face because it protects the skin. The two toner pads that have worked really well for him are the Beautycounter Anti-aging toner pads and the new men's line, Counterman toner pads. It's important to determine what type of acne your pre-teen has: oily skin, dry skin, or hormonal acne. If you use a skincare line that's not right for your type of acne it could cause more problems. Stacy's other son, Finn, finds that using a cleansing balm works really well for him. It's a type of moisturizer that you can either wash off or leave on. Anything that's animal fat-based (like a tallow balm) will have vitamin A. Be careful of supplementing with vitamin A because it can cause Vitamin A toxicity and weaken your skin's ability to protect itself. Deficiency is linked with acne. There's no evidence that topical vitamin D is particularly helpful. Stacy says to encourage your teen to do something. The approach she takes is asking "would you like help with that?" Stacy specializes in safer skincare so if you would like help determining your skin type and finding the best products, get in touch with her! She'd be happy to help you out. It can be challenging to get your kid to stand still in front of red light for 10-20 minutes, but it's so worth it! Get your questions in! We want to hear from you! And there's no end to questions we can answer and topics we can address! Resources TPV Podcast, Episode 140: The Danger of Ketogenic Diets TPV Podcast, Episode 326: The Olive Oil-cast! TPV Podcast, Episode 328: The Amazing Health Benefits of Drinking Tea TPV Podcast, Episode 302: Is Blue Light Harmful and What Should I Do? Stacy is wet (because she just did water aerobics) and Sarah can't stop laughing. Stacy just lathered herself in Vitamin C cream (hopefully to combat the effects of pool water chlorine) and she's wondering if that's actually effective. Sarah isn't sure! And she's more than happy to admit that she doesn't know the answer! These conferences are for NTPs (Nutritional Therapy Practitioners) and NTCs (Nutritional Therapy Consultants) who have graduated from the NTA program and have a solid foundation in nutrition and health. Sarah's keynote was on the gut microbiome and she had a blast sharing it with practitioners because she totally got to nerd out! One thing that stood out this year was the number of exhibitors. Sarah loves seeing her favorite brands, but also discovering new brands and meeting their owners so she can bring you more awesome products that will benefit you! What do you want to get out of the conference experience? Education? Business connections? Unfortunately, Sarah's NTA keynote will not be available online, however, she will do a similar presentation at this year's PaleoFX! This panel was moderated by Mickey Trescott (on the podcast two weeks ago) and featured Angie Alt, Dr. Rob Abbott, Dr. Gauree Konijeti, and Sarah. These two clinicians have really led the research on using the Autoimmune Protocols to treat Autoimmune disease. The panel discussed scientific evidence, how we approach therapies that are supported by science vs disproven by science. Sarah enjoyed talking about the need to stay rooted in scientific evidence in order to effectively educate people. When we start to let pseudo-science creep in, we undermine the validity of the much more important messaging we're doing. However, it's important to acknowledge that we don't know everything and there are a lot of unanswered questions. When we're faced with evidence that disproves theories, we need to be open to that evidence. We need to be cautious of our tribalism and not dismissing things because they don't agree with our beliefs. 8 people told Sarah it was the best NTA panel they'd ever seen! Sarah wants to give a shout out to Mickey and Angie for a very well thought out panel! There were great discussions about how functional medicine and nutritional therapy interface. (36:05) Check out Sarah's special issue of Paleo Magazine, The Autoimmune Protocol Guide! The only way to get this special issue is to buy it in stores like Whole Foods, Barnes & Nobles, or other local health food stores (this issue is not included as part of your Paleo Mag subscription). This issue includes everything you need to know to get started on the Autoimmune Protocol in one place! Only available while supplies last so don't wait to get your copy! In this episode, Sarah and Stacy are answering not one, but two listener questions, tackling healthy travel, school lunches, and portable snacks. They're sharing their tried and true tips for how to keep their families feeling good while traveling internationally, the paleo-friendly snacks they pack in their kids lunches, and you'll learn if European bread really is safe! Sarah is headed to the Nutritional Therapy Association annual conference where she will be a keynote speaker, so they're recording this episode a little earlier than usual. This week we're talking about something Sarah and Stacy have been doing a lot of recently: staying AIP while traveling. A big shout out to this week's episode sponsor and Stacy's favorite food, Chomps! Both Stacy and her boys love them! In fact, Stacy's boys did a quick PSA for Chomps! Chomps is a 100% clean, on the go meat stick that has 9-10g of protein per stick and real food ingredients. Amazing news: Chomps is launching two AIP-friendly flavors in March: Italian Style Beef and Sea Salt Beef! Sarah was involved with the creation of these flavors so you can be sure they're 100% AIP-approved. If you're not ordering them by the case (like Stacy), you can pick them up at Trader Joe's! Go to Chomps.com/PaleoView and use code THEPALEOVIEW for 20% off and free shipping! Hannah says:"My family and I are planning our first international trip since the boys were born. We are planning a trip to Europe (Lisbon, Portugal specifically) and would love your advice on a paleo approach to international travel. What are your recommendations on sleep schedules, exercise, and eating (of course!) while traveling internationally. I have heard that grains in Europe (including wheat) are not modified in the same way they are in the U.S., and am wondering if we could break our paleo "template" to try some local specialties, without risking a health crisis. I love your show and faithfully listen every week while shuttling the boys to various commitments. I think I will be officially starstruck if my question makes it on your show." Susan says:"Hi ladies! We’re pretty new to Paleo and I’ve found your podcast to be an awesome resource. I’m sorry if you’ve covered this topic before. My son is currently in a half-day preschool, so he eats lunch at home. But, he’ll be starting kindergarten in the fall. I know that there won’t be much he can eat at the school cafeteria so I’m wondering what to pack for his lunches and classroom snacks so that he doesn’t feel different from the other kids." For Stacy, it's protein first. Protein is very satiating and it's something that will sustain her and her kids in a healthy way. Portable protein like Chomps is something her family always carries. When traveling, Stacy plans on two meals a day: breakfast and either lunch or dinner. In addition to protein snacks, Stacy also packs convenient snacks like Larabars. She looks for snacks that are lightweight, non-bulky. She tries to stay in an Airbnb or somewhere that has a kitchen so they have to option to cook meals. Sarah agrees. She keeps Chomps in her purse or when traveling, in her suitcase, so she has a protein snack handy. Fruits and nuts, are easy to find when you're out and about. Pre-packaged snacks are better for international travel. For school lunches, Sarah always starts with a protein and builds the lunch from there. If you have a kid who's having a tough time transitioning and is worried about what other kids will think about their food, there are "real food" packaged foods you can use to transition them. Start by swapping out the packaged foods for healthy packaged foods then slowly start to swap out one healthy packaged food at a time for real foods. Stacy's boys really enjoy Chomps, Larabars (not safe for nut-free classrooms), and fruit snacks. Read the ingredients, avoid added sugar. Sarah and her kids love Veggie Go's fruit/veggie strips. Empower your kids by letting them choose the snacks they want! Give them a $20 budget, pull up one of those online shops, and let them choose the healthy snacks. Sarah focuses on protein snacks for her kids. They noticed that Larabars on their own was too much sugar so these days, she'll pack a Chomps with sliced apple. Hard apples like Fuji apples or grapes, strawberries, blueberries, and blackberries keep really well in a lunchbox. Communication is key! Communicate with your kids and be willing to troubleshoot and adapt. Stacy has a big cruise coming up, but she's been strategic about it. She tries to do direct flights (versus layovers) to avoid extra security checkpoints and added stress. Unfortunately, it is a red eye, but she's bringing melatonin to help everyone sleep. When flying internationally, meals are often included and these days you can choose allergen-friendly meals. If you don't have the option to choose, call the airline after booking to ask for a gluten-free meal. Sarah says bring entertainment (books, colored pencils, devices, etc) and anything that will help you or your kids sleep. Do your best to anticipate problems and plan for it. This doesn't always work so just do your best! Some people do really well with European bread. Europeans use an older variety of grain that hasn't been modified as much. It contains about the same amount of gluten, but the difference is in the trypsin amylase inhibitors. Our modern varieties of wheat have about 100x more than the heirloom varieties in Europe. Sourdough has been fermented longer which makes it a better option. This is a very individual choice. If you do get sick that's going to put a damper on your trip. When traveling, your body is less stressed which means you'll be digesting food better! Europeans are very accommodating of gluten-free diets. Stock up on allergen cards in every language so you can clearly articulate your needs. Thanks again to our episode sponsor, Chomps! Stock up at Chomps.com/PaleoView and use code THEPALEOVIEW for 20% off and free shipping! Paleo To Go Ebook Travel Ideas: Paleo snacks and fun car games! Please welcome special guest, Mickey Trescott of Autoimmune Wellness! Mickey has a new book coming out titled The Nutrient Dense Kitchen. With the explosion of the Autoimmune community in the past couple years, Mickey has noticed there's been a loss of focus on nutrient density. Mickey wrote this book to be approachable with a lot of nutrient dense recipes so you don't have to be afraid of food. You can change your health by what you put on your plate! Sarah is super excited about Mickey's new cookbook! It's gorgeous and she and her children are already bookmarking recipes they want to try. Mickey and Sarah were two of the first handful of people to do the autoimmune diet. Sarah first gave it a try in 2011, just 4 months after discovering the Paleo Diet. Mickey first found the Autoimmune Diet after seeing Dr. Terry Wahls' TEDx presentation on how she manages MS with diet and lifestyle. At that time there were just a few mentions of the autoimmune protocol - one page in Robb Wolf's book The Paleo Solution and half a page in Loren Cordain's The Paleo Diet. Funny thing is, the food recommendations on each of these lists didn't even match up, it was such a new idea. Stacy remembers back in the day people didn't even know what nightshades are! There are now clinical trials which are beginning to bring medical awareness to the autoimmune protocol. Mickey and her partner at Autoimmune Wellness, Angie Alt, are working with researchers on AIP clinical trials. Mickey, Angie, and Sarah have co-created and co-teach the AIP Certified Coach Practitioner Training Program, an advanced training for practitioners across the spectrum of both natural and conventional healthcare. Up til now, evidence that AIP works has just been anecdotal. The study Mickey and Angie are involved with showed a 73% improvement in remission in just 6 weeks! It was an 11 week study. The first 6 weeks, patients did Angie's SAD to AIP in 6 program (which transitions people into the AIP diet). Then they stayed on the AIP diet for the next 5 weeks. They were given copies of The Paleo Approach and The Autoimmune Wellness Handbook as their two main resources. 73% of patients were in full clinical remission by the time they finished transitioning to the autoimmune protocol in week 6 and maintained it. Mickey says the most powerful takeaway was that these people were not newly diagnosed. They'd been living with an autoimmune disease for an average of 19 years and many of them had failed biologic treatment. The 27% of people who didn't achieve remission still had quantifiable improvement, but didn't achieve remission. More studies on quality of life and gut microbiome health are coming. They've also partnered with Dr. Rob Abbott for a study on Hashimoto's. They crowd-funded this study thanks to the AIP community! AIP has always been more than a fad diet because it's based on science and logic. This movement has grown thanks to the people who've done it! There are over 100 AIP bloggers today. Thousands have told their doctors about their results on AIP. It has a powerful snowball effect! Sarah guesses there are at least a million people out there who have a connection to AIP. It's thanks to everyone who has done AIP that there are now more options on the grocery and in restaurants. One of the most special things about AIP is the community - and they're all over the world! Get online and find an AIP group today! Pick up a copy of Mickey's new AIP-friendly book, The Nutrient Dense Kitchen, online or in stores today! Sarah says a big thank you to Mickey and Angie for all their incredible work in the AIP community. Connect with Mickey at www.autoimmunewellness.com! Sarah still has a voice after her epic Workshop and Retreat at 1440 Multiversity! Sarah says it was an incredible experience. The location, 1440 Multiversity, was amazing. They were steps from a redwood forest! The food was incredible - tons of vegetables, delicious coffee, plenty to eat. The presentation stage was gorgeous. Good news! Sarah will be doing another retreat next year so if you missed out, stay tuned for more on that. Participants were able to take advantage of free classes like yoga and tai chi between Sarah's lectures. And Sarah says the people were the best part. It's so special to connect with her community and see them connecting with each other. Sarah can sum it up in one word: "Profound"
If you wished you were there, Sarah had a film crew record all the sessions which means a virtual version of the workshop will be available for purchase on her website! Keep an eye out for that in the next couple weeks. 1. Sarah did a deep dive into gut microbiome health. Most of this info hasn't been shared anywhere yet. The one that got the cheers was dark chocolate! The polyphenols in cacao support the growth of good bacteria and inhibit the bad. Distracted eating: if you eat while in front of a screen, you'll eat more and you'll eat more later in the day. Family meals or eating socially don't qualify as distracted eating. Stacy reunited with her local paleo community this weekend! Russ Crandall, from The Domestic Man, has a new book coming out which Stacy is very excited for! Keep an eye out for that! Regarding chocolate, the benefits are in the cacao so the higher the chocolate percentage the better. In this episode, Stacy and Sarah share why you need houseplants, the health-harming toxins they protect against, the best houseplants for air purification and detoxification (especially if you have pets and a black thumb), and tips for keeping them alive. Stacy prepared a record number of notes for today's podcast topic - 24 pages! Sarah is putting the finishing touches on the slides for her event this weekend, ThePaleoMom Workshop and Retreat at 1440 Multiversity! FYI, "houseplants" is one word! That's something Stacy learned preparing for this show. Houseplants can act as air purification systems in your home. However, they can be toxic to pets. A special thanks to this episode's sponsor, Joovv! Joov makes amazing red and near infrared light therapy devices! It's a great tool for detoxifying the body. Red light therapy is great for autoimmune disease, pain management, depression, improved energy, reduced pain, improved skin, and enhanced weight loss. Sarah loves her Joovv red light therapy products! She's been using them for 2 years. She has a Legacy, a Quad, and the brand new JoovvGo. The new JoovvGo is an on-the-go, battery-operated, hand-held red light therapy device perfect for travel and spot treating. Check out their amazing collection of products, along with the new and very affordable JoovvGo, at https://joovv.com/paleoview. (14:20) What's in our air that plants could help purify? In 1989, NASA did a study to figure out how to purify the air for astronauts in space. They screened for the toxins, benzene, formaldehyde, and trichloroethylene. Since then there have been a number of other studies identifying other air toxins including xyelene and ammonia. is a toxic, volatile, flammable liquid hydrocarbon which is a byproduct of coal. It's an industrial solvent found in most things to do with furniture: paints, varnishes, lacquer thinners. Benzene causes central nervous system damage, bone marrow damage, and is carcinogenic. Stacy notes that there are companies out there who do not use these chemicals. One that Stacy found is Pottery Barn (not an endorsement). Environmentally, it can be found in the atmosphere, fire smoke, and cigarette smoke (to name a few). Really dangerous when ingested. Vapor can be toxic. Can be managed in small loads. A synthetic, volatile, light-sensitive, colorless, liquid that is miscible with organic solvents. Associated with metal because it can be used as a degreaser. In the process of combustion, it can produce irritants and toxic gases, which can lead to liver cancer, kidney cancer, and lymphoma. (21:42) Why are plants good detoxifiers and which are best? Photosynthesis! They take in the air for photosynthesis to use carbon dioxide. They trap the toxic chemicals and filter them through their root process. It's largely leafy plants (that don't have a lot of flowers) with a strong root system that are the best purifiers. Stacy and her family started with a Money Tree because it was strong, sturdy, has a good root system, and is hard to kill (Stacy doesn't exactly have a green thumb). Every couple of months they add a new plant. These leafy plants alleviate "sick building" syndrome. Sarah notes that in addition to purifying air, plants also have a calming effect. Check out their podcast episode TPV Podcast, Episode 267: The Benefits of Nature for more on that! Ivy plants make great office plants because they're air purifiers, but they're toxic to pets if eaten. Snake plants are also great air purifiers. They, too, are toxic to pets. Stacy has come up with a workaround to this by putting it on a pedestal in her home, out of reach from pets. What happens to the toxins plants take in? Plants, like us, have microbiomes. The soil also has a microbiome. Bacteria are amazing detoxifiers, so they metabolize the toxic compounds into harmless compounds. In the 1989 NASA study discovered that houseplants made a significant difference in removing VOCs from the air. They tested a number of different factors like leaves, flowers, roots, and that's how they determined the plants with root systems are the best for purification. Sarah notes that in this study, some of these plants could remove up to 90% of benzene in the air in 24 hours. That's incredibly efficient! English Ivy is one such plants that remove up to 90% but beware as it is toxic when ingested. This database on the ASPCA identifies plants that are toxic to pets. Stacy has created a list of houseplants that are hard to kill, good for pets, purify, are non-toxic, are more hearty, and do not require full sun. Stacy chooses to include the Snake Plant, ZZ, and Aloe in her home, despite their toxicity for animals, because of their health benefits. All are out of reach of pets and do not "shed" leaves, making them less of a risk for her home - but be mindful about placement for these 3 plants if you have pets. If your plant dies, you're not a failure! The soil is still purifying the air! Episode 338: Integrative, Functional or Naturopathic? In this episode, Sarah and Stacy are clearing the confusion surrounding a common question: what's the difference between integrative, functional, and naturopathic medicine? They're breaking down what makes each of these areas of medicine unique as well as giving their recommendations for how to find the best doctor for you. Last week's episode TPV Podcast, Episode 337: What’s the Deal With Celery Juice? is going viral! If you missed it, be sure to check it out! "Hi Stacy!I am binge listening to yours and Sarah‘s podcast, which I know, you’re sorry, ha ha, and I’m at the episode where you introduce RealEverything.com, and you just gave your email address out, and so that prompted me to just send you an email, which is a long time coming. I just want to say thank you so much for the podcast! It has changed my life in so many ways. I’ve been on and off Paleo for probably about like eight years now, but as I start to learn more of the science, I just find that I am making better decisions and really allowing this to be a lifestyle and not just something I half heartedly do some of the time. I know Sarah would be really happy to hear that Anyway, I could say so much but I really just wanted to say thank you and to let you know that what you guys do really does make a huge difference in peoples lives and in their health, and therefore in living a longer and more for filling life, and so I can’t thank you enough. Literally, in all my spare time I’m listening to the podcast because I just want to absorb as much information as possible and you guys are so thoroughly entertaining that I can think of no better way to spend my free time I wish you and your family the best of luck in everything you do! Jessica"
Stacy says it's easy to get caught up in any negative feedback about the podcast (or so many other things!) so it's really heartwarming to receive listener feedback like this. It's a great reminder to be positive on the internet and in communications, not just negative. Do your best to be a good person! (16:05) Today's topic: the difference between integrative, functional, and naturopathic medicine? Megan asks: "What is the difference between Integrative medicine, Functional Medicine, and Naturopathic medicine? And this is somewhat rhetorical, but why are none of them covered by conventional medical insurance? I am researching alternative medical providers in my area and since none are covered by insurance, I would like to get as much bang for the buck as possible. Any clarification would be appreciated.Also In my search for alternative care, I found several providers offering a "Zyto Advanced Scan" using zyto technology. To put it in a term I have heard Stacy use - is this woo woo?" Side note... go watch James Corden's updated version of Alanis Morissette's "Isn't it Ironic?". Sarah notes there's a new health insurance called Knew Health whose mission is to make alternative medicine something that is covered. Look for an "Integrative Medicine Specialist" or "Integrative Medicine Doctor." Make sure they have an MD at the end of their name. Instead of giving you a drug to mask symptoms, a functional medicine doctor wants to figure out what's causing this in the first place. A functional medicine practitioner can be an MD but doesn't have to be. Naturopathic doctors, on the other hand, do a similar training but in a different program. This program has a different philosophy that's centered on using the power of nature in supporting the body's inherent ability to heal. They will likely do a wide range of alternative therapies, even the ones that aren't strongly backed by science. Sarah and Stacy are calling this one a little "woo woo." What are your first line treatments? Do you tackle diet and lifestyle first or herbals and botanicals first? Ideally, they're doing saliva, stools, and urine tests. Muscle tests don't have much scientific validity. Stacy says to trust your gut. You are paying for a service the same way you're paying for a service in any other capacity. Just because someone has a recommendation, it doesn't mean it's the right recommendation for you. It's common to have NPs in practices doing the simpler cases. Copyright 2012 Matthew McCarry, Stacy Toth and Sarah Ballantyne. All rights reserved.